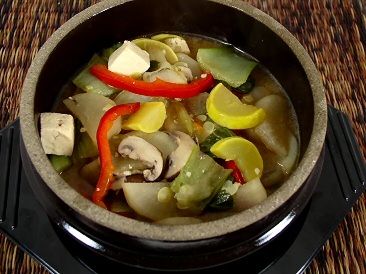 I’ve been eager to use the new bowls I got from the Korean grocery store, so I looked around the internet until I found a stew that looked perfect at Vegetarian Times. I have to admit that I hardly changed anything about this recipe, just made a few substitutions for ingredients I didn’t have. The result was great, but not spicy at all. I blame that on a jalapeño that was really mild. In the end, that was a good thing since I’m feeding a spice-hating child. But I suggest serving this with some spicy kimchee or hot sauce that can be added at the table. Pour water into a large deep skillet with a domed cover. Add miso, and stir to dissolve. Add the mushrooms and garlic and bring to a boil over medium-high heat. Place the tofu, bok choy, daikon, and squash in the skillet in a pinwheel pattern. Cover, bring to a boil and cook about 10 minutes. 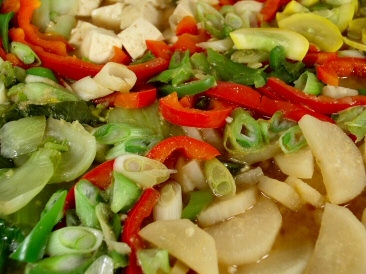 Place the green onions and peppers evenly between the other ingredients and cover again. Cook for a couple of minutes, or until green onions and peppers become fragrant and colors turn bright. Cook the stew no longer than 15 minutes total. Drizzle sesame oil over all just before removing from heat. Stir and serve immediately in heated bowls with steamed rice. It’s really a beautiful dish when the vegetables are all separated like this. That’s the only reason I can think of to cook it this way–it makes a nice presentation until you stir all the ingredients together. If you’re counting calories, this is the recipe for you! Though it’s supposed to serve 4-6 people, it came out to be more like 6-8 servings. At 8 servings (without rice), it breaks down to 105 calories, 4 grams fat, 12 grams total carbohydrates, 3 grams fiber, and 7 grams protein. Eat up!